A humanoid percussion mechanism that can me mechanically programmed. 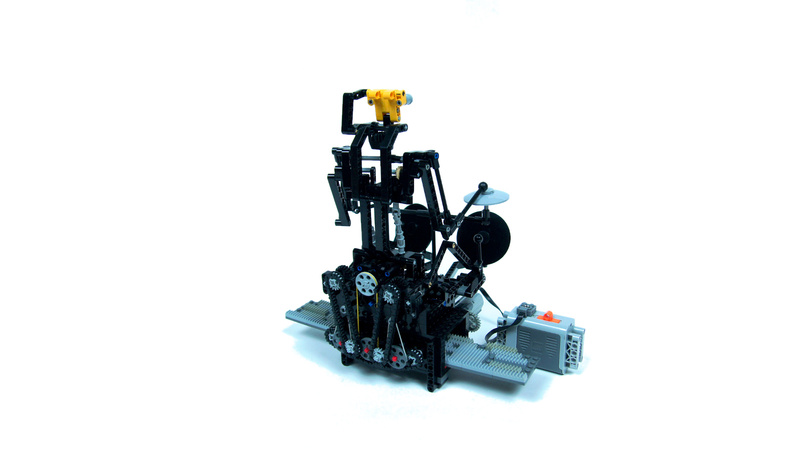 This unusual creation was inspired by the LEGO Technic 8888 Ideas Book that is actually older than me. 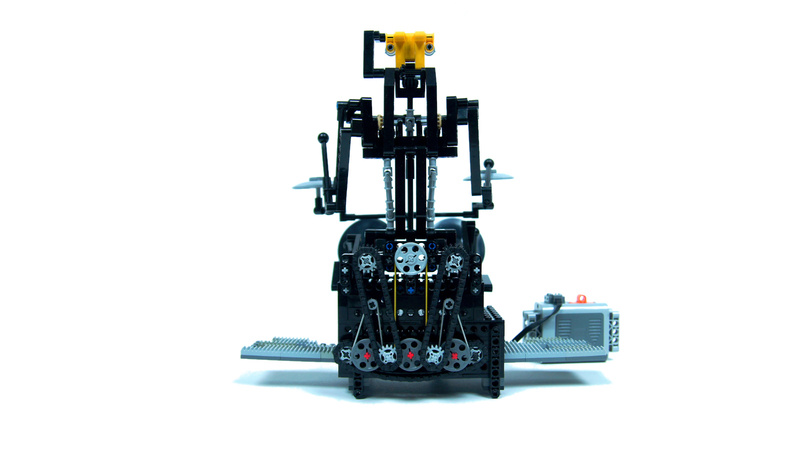 The book features, among other things, a mobile crane that can be mechanically programmed by rearranging racks on a plate that is then pushed through it by a motor. My first reaction to this was “whoever invented this was insane”, shortly followed by “wait, I can use this”. This led to the creation of a simple percussion mechanism which was given a roughly humanoid form. The mechanism was activated by a 6studs wide plate with racks. 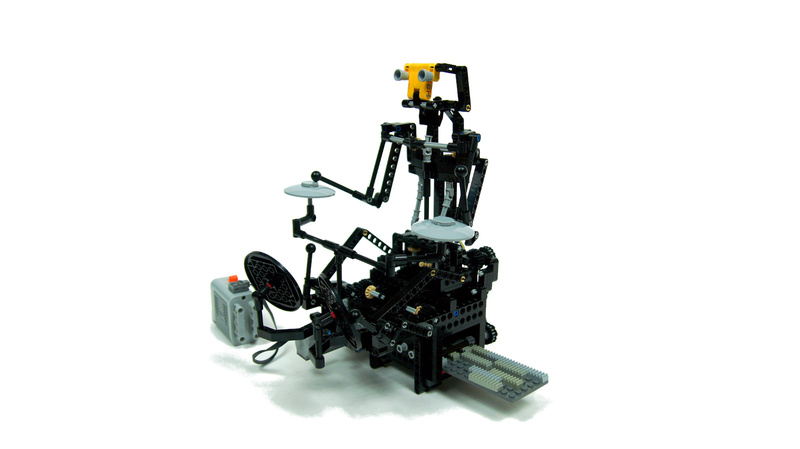 One strip of racks was used to drive the plate through the mechanism, while the other five controlled both arms, both legs and a head of the “drummer”. By rearranging the racks on the five strips it was possible to “compose” the music the drummer would “play”. This creation was primarily a proof-of-concept that worked as intended, but ran into a number of problems that were difficult to solve. Most importantly, the Medium motor was loud – the old 71427 motor could be used instead, for it runs very silently, but it wouldn’t have enough torque. Additionally, the motor was very strained, as the “drums” had to be hit fast and strong in order to sound loud. I had to gear down the drummer’s arms because the initial gear ratio, which ensured loud sound, caused the motor to stall. Finally, it turned out – as could be foreseen – that all LEGO pieces sound more or less the same when hit, regardless of their shape, direction or strength of the hit. Still, it was something refreshing to work on. Why don’t try to recreate Abiture instrument with this? Or use Mindstorms? Great work anyway! Very inspiring! How about two M-motors coupled with an adder? Two added M-motors have roughly the same torque as an L-motor, give or take a few decimal numbers, and the speed will be the same. Your work is brilliant! 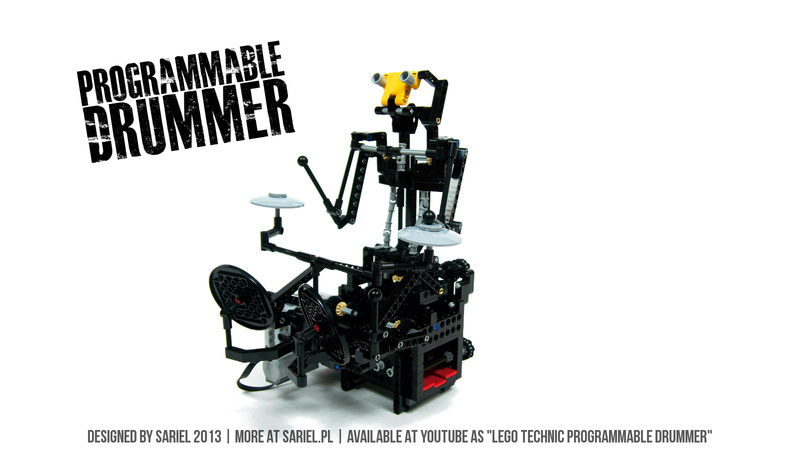 …I think this Drummer is among my favorites of your builds. It has the ability to convey a sense of personality. 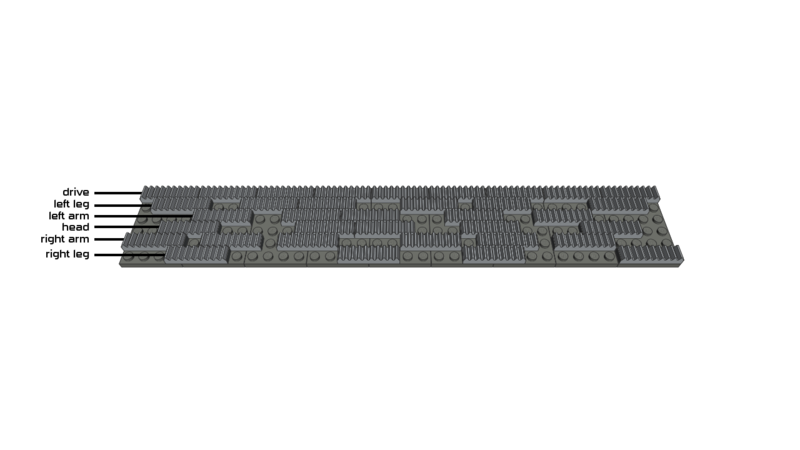 …That seems to be really hard to do with Lego elements. You need to put together a project for Kickstarter that’s a collection of instructions for your favorite pieces. If so many people are requesting instructions, it would be a way to get funded up front and make it worth your while. You have a community to support you. I like the drummer’s blend old-style “studded” Lego with new “studless” liftarms. 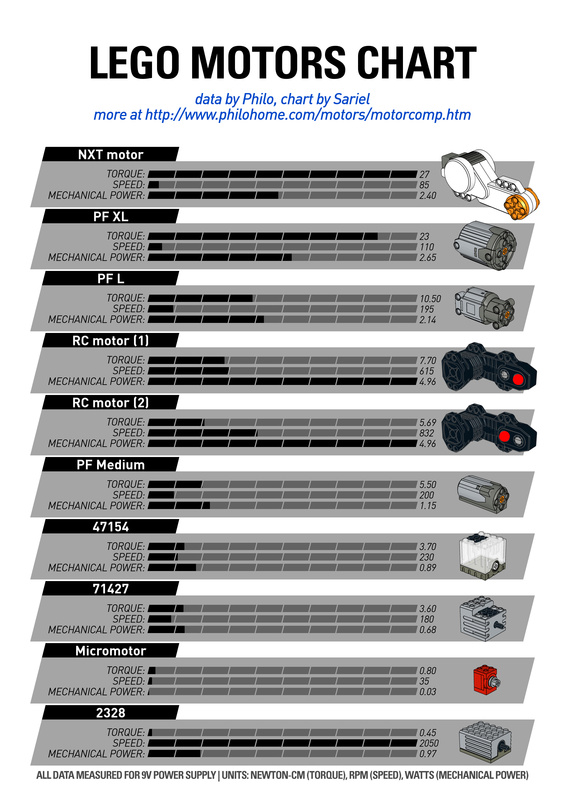 If the Power Functions M-Motor is straining, perhaps it could run with a PF L-Motor instead (although a bit slower). 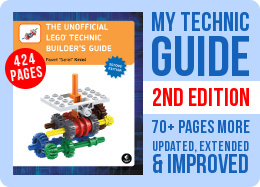 The Lego Technic 8888 Idea Book ( https://skydrive.live.com/view.aspx?cid=5641CCE2A1CC0886&resid=5641CCE2A1CC0886%21162&app=WordPdf&wdo=1 ) has lots of cool ideas like this — thanks for your modern interpretation of the drummer!